Out with the old, in with the new; TCX brings a new slew of riding sneaks Stateside. The X-Square shoes gained a lot of traction (heh) in the market and we warmly welcoming these addition: the X-Square EVO WP, Sport, Sport WP, and X-Roadster WP. We loved the simple feel and good protection of the original X-Squares especially given their entry-level price point. If you’ve ever had them on your feet, however, you’d know there was not much that was “entry” about them. The new TCX X-Square EVO WP Shoes still provide excellent bang for the buck with the same sleek low-profile design but with refined styling, greater ankle coverage, Fast Lace system for easily attainable custom fit, and a waterproof membrane. They’re fully capable riding shoes that are subtle enough to not scream “HEY!!! I ride a motorcycle! Look at my stormtrooper boots! Look at ‘em!” Despite your preconceived notions about us, sometimes we like subtle, and we certainly like these. The TCX X-Square Sport Shoes and TCX X-Square Sport WP Shoes have all the same features of the EVOs but are offered in non-waterproof trim and add molded polyurethane toe sliders. The styling is a bit more aggressive and will most likely gravitate towards the sport riding crowd but are versatile enough for cruisers, V-twins, and tourers. 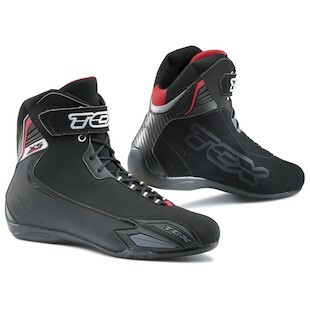 If you were bored and decided to inject your X-Squares with steroids, then you may come up with something like the TCX X-Roadster WP Shoes. 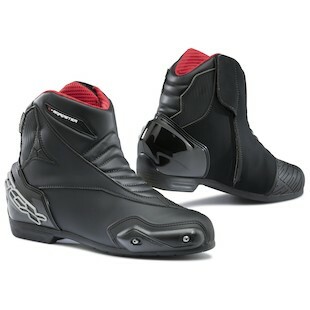 These are very similar to the Sidi Blade and Alpinestars SMX-1/SMX-2 shoes but boast a waterproof membrane. The Roadsters have robust protection with heel and toe counters, ankle reinforcements, and replaceable toe sliders. TCX’s Fall 2013 release includes a smorgasbord of riding shoes to suit just about anyone’s tastes. We hope you’re hungry!